My husband is an academic, which means he’s invited to conferences in truly awesome places all the time. Skiing in the Sierra Nevada Mountains in Spain coupled with a tour of Alhambra in Grenada, the tapas capital, anyone? A week in Tenerife in the Canary Islands? Or perhaps culture capitals like Barcelona, Budapest, and Beijing? Since his hotel is already covered, I try to tag along when I can. Last winter when he had a conference in Lake Tahoe, I was able to go for less than $200 roundtrip even though we booked less than two weeks before departure. Around $230-$250 used to be the standard for flights between the northeast and California a decade ago, but the tumult in the airline industry has fixed the average closer to $400 in recent years. The first price I found was $358. Not bad, but let’s call it an “unpolished fare”. When I’m looking at airline tickets, I always get a baseline and then try to shave off a few hundred dollars. I check alternate local airports (especially in big urban areas like NYC, San Francisco, and London) and a three-day spread on either side of my proposed date. I often find far cheaper tickets that worked better than my original dates. In the case of the Tahoe trip, I got down to $234. At this price, paying with airline points is not usually a good idea, though the Starwood Preferred Guest American Express does offer a unique loophole. More on that here. But we had an even better option: the Chase Sapphire Preferred Card. As long as you have enough points in your Chase account (and you can often call and get a debit against your next statement if that will help push you over), you can book your flights through the Ultimate Rewards interface at a 20% discount on the listed price. When you’re on the fence about a trip, having a card that knocks 20% off every flight can make all the difference. If you’re saving up for an around-the-world ticket or a long-haul flight to Asia or Australia, it doesn’t make sense to blow your airline miles on an inexpensive fare. When your trip is coming up soon, you can’t always wait for points to come through. Transferring points from your credit card to your airline awards program can often take up to two weeks. While it varies from airline to airline points-per-dollar awards like JetBlue and Virgin America are notable exceptions most award points are valued at one cent per point. In the case of my Tahoe trip, all three of the above situations more or less applied so booking with points was the best option. Lake Tahoe is known in ski circles for having one of the longest and warmest ski seasons in the world, peaking in April and regularly stretching into June. 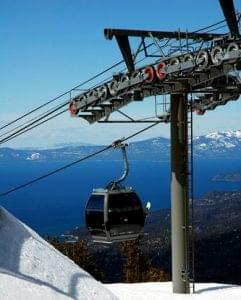 South Lake Tahoe, where we stayed, is home to Heavenly– one of the area’s top ski resorts. It is so big its 97 runs connect to four different base villages. And if you aren’t in a skiing (or snowboarding) mood one day, there is a lot going on besides skiing. If it’s your thing, you can saunter up to an immense row of casinos just over the Nevada state line. But my favorite thing to do was hop the gondola from the valley floor and enjoy the view at the first stop the observation deck just on the peak facing the lake. Not bad for 18,720 points roundtrip.